The Romans saw themselves as having a highly advanced civilization, and they looked down on the cultures of the people who lived beyond the borders of their empire. In AD122, Emperor Hadrian built a wall separating the Roman part of Britain from the mountainous land now called Scotland. The Romans called the Scottish people “barbarians,” possibly because the Scot’s native Celtic language sounded to the Romans like the bleating of sheep. The term was eventually used to describe anyone who lived beyond the borders of the Roman Empire. The people who lived northeast of the Roman Empire spoke languages similar to modern German. 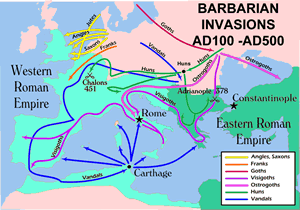 These “Germanic tribes” included the Vandals, Lombards, Alamanni, Goths, Franks, and Burgundians. Most of the tribesmen did not know how to read, but unlike the Huns, they tended to farms and were not nomadic. By the Middle Ages, most of the Germanic tribes gave up their pagan beliefs and became Christians. In 376CE, the Huns forced the Visigoths (western Goths) to leave their homeland near the Danube River in modern Austria. The Visigoths asked Emperor Valens permission to settle inside the Roman Empire. Valens agreed, but charged the Visigoths unfair prices for food and other supplies. When the Visigoths protested, Valens ordered them to leave. The Visigoths refused and formed an army that defeated and killed the emperor in 378. Alaric was a Visigoth who joined the Roman army and rose to a high rank. Alaric left the army to became king of the Visigoths when his father died. In 410, the Romans refused to pay a bribe, so Alaric’s soldiers formed a siege around Rome. When the city was close to starvation, the Roman citizens opened the gates and allowed the conquering army to enter. The Visigoths rampaged through the streets for three days, pillaging and burning the city. Alaric ordered his army not to molest women or destroy churches. Rome was not completely destroyed, but for the first time in nearly 800 years, the “Eternal City” had been defeated. Germanic tribes overran what was left of the Roman Empire. The Ostrogoths, or “eastern Goths,” came from land we know call the Ukraine. The Ostrogoths conquered most of Italy, Greece, and the western Balkans. The Vandals took control of the Roman territory in North Africa. The Franks overran France, while the Saxons conquered the southern part of England. The Goths lent their names to many genres. Gothic architecture features sharp lines and precise angles. Gothic churches and cathedrals have tall spires while Romanesque architecture is generally more rounded. Gothic literature refers to gloomy stories with supernatural themes. Some teenagers use the term Gothic to refer to music and fashion they describe as broody, dramatic, and dark. 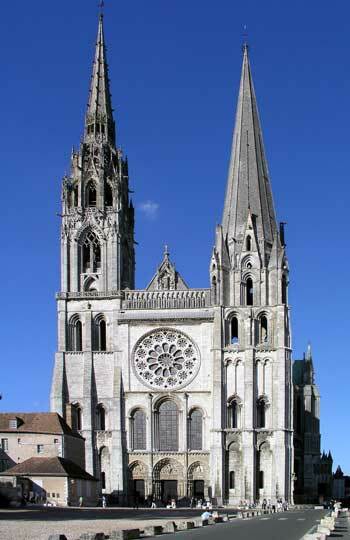 France’s Cathedral of Our Lady of Chartres is an example of Gothic architecture. 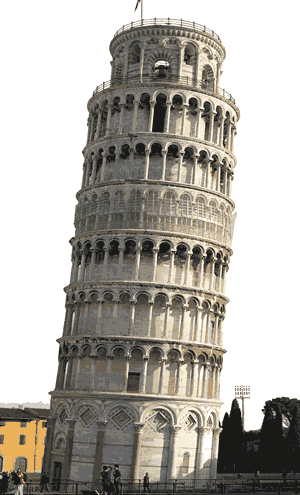 The Leaning Tower of Pisa in northwest Italy is an example of Romanesque architecture.